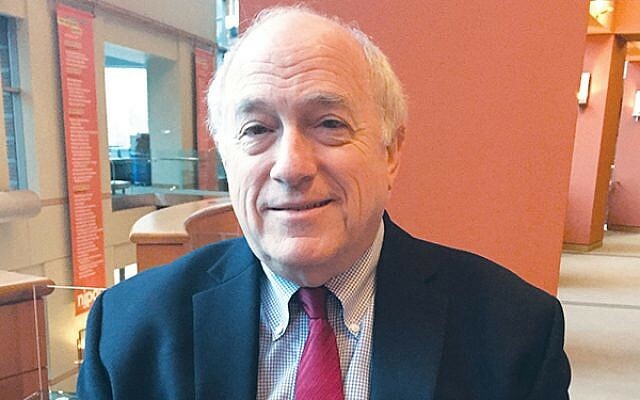 Had Daniel C. Kurtzer, former U.S. ambassador to Israel and Egypt, and former Palestinian Prime Minister Salam Fayyad, been at the negotiating table, perhaps there would have been real progress in the Mideast peace process. 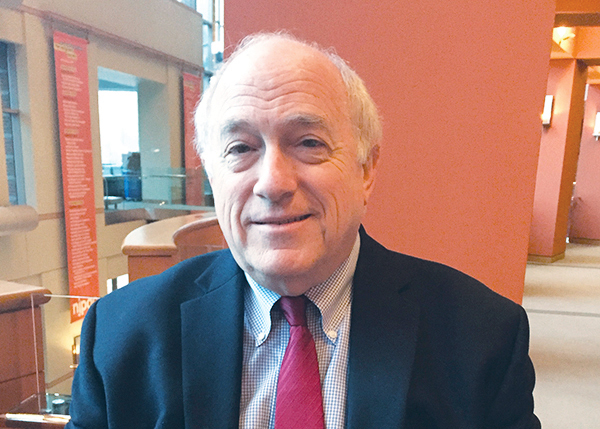 Kurtzer, a 69-year-old Orthodox Jew and native of Elizabeth, and Fayyad have become good friends through their work and interaction at Princeton University’s Woodrow Wilson School of Public and International Affairs. They exchanged views on a two-state solution and other matters as part of a New Jersey Performing Arts Center series in Newark on April 2, which happened to be Fayyad’s 68th birthday. Fayyad had previously served the Palestinian Authority as finance minister and with the International Monetary Fund in the West Bank and Gaza Strip. Fayyad, who was in office from 2007-2013, has mostly eschewed media requests since giving up his post as prime minister over differences with Palestinian President Mahmoud Abbas regarding economic policy. Having received a doctorate in economics from the University of Texas, he flashed a “hook-em horns” sign when introduced to the audience of 250. Fayyad is visiting senior scholar and Daniella Lipper Coules ’95 distinguished visitor in foreign affairs at the Wilson School, a senior fellow at Harvard’s Kennedy School of Government, a distinguished fellow with the Atlantic Council’s Brent Scowcroft Center on International Security, and a distinguished fellow at the Brookings Institute. Both Fayyad and Kurtzer are steadfastly in favor of a two-state solution, despite the obstacles it now faces following intermittent periods of optimism since the 1993 Oslo accords. “The two-state solution is the best conclusion.” Fayyad said. “The Palestinians have to have a definite statement from Israel that they respect our rights to live in freedom and dignity in our own state. 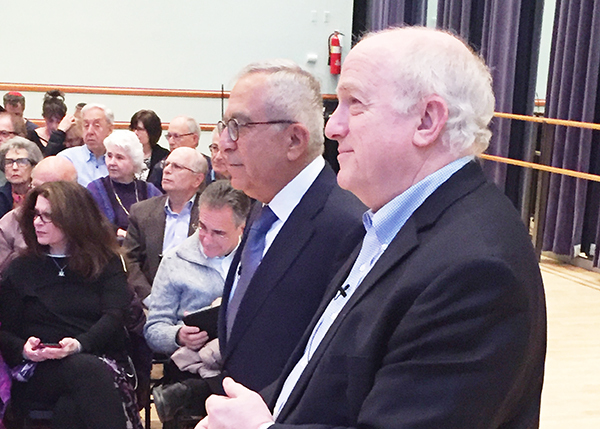 Daniel C. Kurtzer, right, and former Palestinian Prime Minister Salam Fayyad at the New Jersey Performance Arts Center in Newark. In 2008, then-Israeli Prime Minister Ehud Olmert offered the Palestinians 93 percent of the West Bank and all of Gaza when the Palestinian Authority regained control of that territory from Hamas. The Palestinians rejected the offer. Further complicating matters, in recognizing Jerusalem as Israel’s capital and moving the embassy to the city, the Trump Administration has enraged the Arab world; its leaders cite it as as evidence that the U.S. cannot be considered an impartial arbiter in the peace process. Also, because of the settlements built on 60 percent of the West Bank since Olmert made his offer in 2008, only 40 percent would be available for a future Palestinian state. A recent poll in Haaretz found that 42 percent of Israelis, including supporters of two states, favor some form of West Bank annexation. Though rarely mentioned, the Palestinians want their future state to be a democracy, unlike most Mideast nations. Even Hamas was elected in 2006 by the citizens of Gaza. Fayyad mentioned an Israeli statement of rights and Jerusalem as key Palestinian issues, though they cannot be truly addressed without a unified government for Gaza and the West Bank. So, what can be done to revive the long-dormant peace process? For the Palestinians, Fayyad feels respect is the key. “To us, that declaration (from Israel) could be something that can get talks started,” he said. Both friends hope, despite the long-expired enthusiasm that came from the signing of the Oslo Accords, leaders will emerge who can somehow give Israel assurances of security, and the Palestinians their own state.